Nineteenth century New Yorkers were very interested in early New York City history and loved owning pieces that offered a glimpse into that past. This 1847 Henry R. Robinson view of the Government House filled that desire. The Government House, a mansion located at the foot of Broadway south of Bowling Green, where the Alexander Hamilton U.S. Custom House now stands, was originally built to act as the official residence of the President of the United States when New York was still the country's capital. The Government House's construction was authorized by the New York state legislature in 1789 and was completed in 1790. Unfortunately, however, the United States Congress, and with it the President, moved to Philadelphia (and then to Washington, D.C.) before the house was completed. So, instead of functioning as the President's residence, the house acted as the governor's residence. Governor George Clinton moved into the building in 1791 and was followed by John Jay in 1795. Jay was the last governor to live in Government House, as the state government moved to Albany in 1797. By May 1798, the house had been leased to John Avery, who opened the Elysian Boarding and Lodging House. 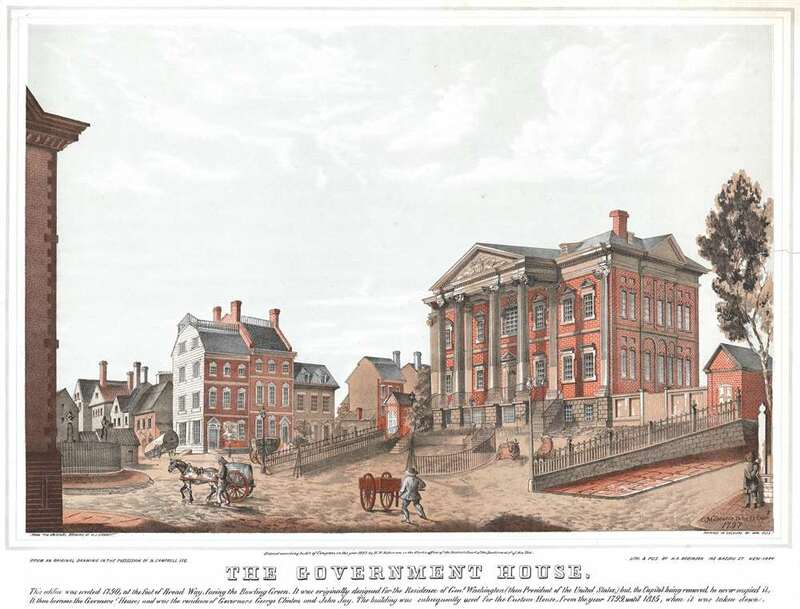 The following year, however, the Government House became the Custom House of New York, and remained in that role until 1815, when the land was sold at auction and the house was demolished. A short summary of the building's history is included as a caption below the view. This view was originally a painting created in 1797 by Charles Cotton Milbourne from a drawing executed by W.J. Condit. The current example was lithographed and published by H.R. Robinson in 1847. This view is extremely rare. We are aware of two examples in institutional collections: one at the Museum of the City of New York and the other at the New York Public Library. We are aware of only a handful of instances when this view has entered the private market in the last twenty years. Henry R. Robinson (fl. c. 1831 - 1850) was a 'lithographer, publisher, and caricaturist' (this is how he referred to himself) active in New York City during the mid-19th century. Robinson informed his clients on the bottom of his trade card that he was a lithographer who would make portrait, bullheads and bills of lading, circulars, maps, plans, designs, and facsimiles. He operated out of a shop at 52 Courtlandt Street, and also had an office in Washington, D.C. on Pennsylvania Avenue, which he operated with Anthony Fleetwood. Although Robinson portrayed himself as someone who created myriad types of content and advertisement, he is most well known for his political cartoons and other prints related to current events. Charles Cotton Milbourne (fl. c. 1799 - 1840) was a British artist active in the United States during the late 18th and early 19th century. Milbourne, known as a landscape painter, is also known to have painted stage scenery in both New York and Philadelphia. Very good. Even overall toning. Closed tear extending 1.5 inches into printed area from right margin professionally repaired on verso. Blank on verso.